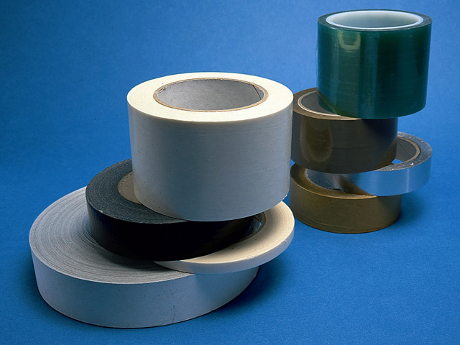 88-20 Polyester Acrylic Splicing Tape Double Sided. Double Sided Polyester Film Tape, Solvent Acrylic Adhesive. An 'overlapping splice' overlaps the end of one roll over the start of the next roll and this overlap is jointed together with a double-sided adhesive tape (adhesive on both sides of the tape), with a good balance of properties. Used for casting / release papers. In the processing of paper, board or foils the initial stage involves conveying these materials over transport rollers for further conversion. The materials come in rolls of 2m wide (or wider) and in roll lengths which can be several thousand meters long. The manufacturing process is continuous, which requires the end of one roll to be spliced quickly to the start of the next roll. Good balanced adhesive system providing good bond strength during actual application , 3 inch core.